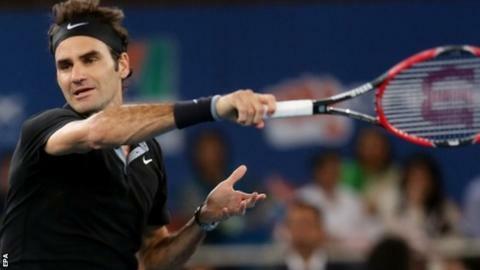 Roger Federer has described the new International Premier Tennis League as "crazy, but fun". The 17-times Grand Slam winner says the tournament doesn't sit easily with his traditionalist views on the sport. Launched in November, top male and female players feature in teams representing four cities: New Delhi, Manila, Singapore and Dubai. Federer said: "My mind was scrambling trying to remember all the rules. It's crazy, but it's good fun." The 33-year-old went undefeated on his debut for the Indian Aces in New Delhi as a late replacement for Rafa Nadal. Federer won his men's singles, doubles and mixed doubles against Singapore Slammers at the Indira Gandhi Indoor Stadium on Sunday. With an emphasis on speed, an IPTL tie comprises five one-set shootouts in men's and women's singles, men's and mixed doubles and a past champions match. The team that wins the most games, not sets, is declared the winner. Andy Murray and world number ones Novak Djokovic and Serena Williams have also featured in the tournament. Federer, who agreed to play only in Delhi, said he found some of the rules strange, and others unnecessary. He added: "The one I think is most unnecessary here is when you start the motion and let's say you miss the ball toss, that counts as a mistake. "I think that's probably most unnecessary. The way it is right now, I don't think it will work as a Tour event. "I'm very traditional and I like the way the game is on tour. I like the scoring system." Additional features include a 20-second serve clock, a 'Happiness Power Point' in where a point is worth double once per set, no advantages, no lets, coaching timeouts and a five-minute shootout if a match is tied at 5-5. Federer added: "It's not going to replace how we play the tour but it definitely has a place in our sport to have more interaction, more fun, and different rules. "You bend it, you customise it, and it works for everyone involved. It's a very interesting concept."